Giro d'Italia - CyclingFever - The International Cycling Social Network - Get the Cycling fever! The Italian sportspaper Gazetta dello Sport is responsible for many cycling events in Italy. None are as popular as the Giro d’Italia. Where most other countries have the perception of ‘One of the Grand Tours, besides the Tour the France’, all Italians think differently. For them, the value of their magical Giro is held in much higher esteem as the French Tour. Despite that common perception the Giro d’Italia has all the ingredients of a prime cycling spectacle. With its enchanting mountainpasses, major “Campionissimo’s” (champions) that all won the Giro at least once and legendary stories that can be told with the same mythical heroism and tensive exitement compared to the history of the Tour de France. 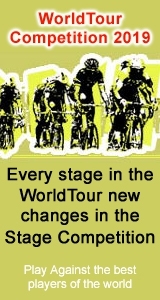 This Tour has also earned its place in the top echelons of professional cycling. On the seventh of august 1908 the Gazetta announces the first Giro d’Italia. Imitating a car race through all of Italy, organised by competitors Corriere della Sera, this pink-coloured newspaper introduces the counterpart of the Tour of France in seven different columns. Milan’s Loreto square is the scene for the inaugural Giro stage. The start is at 02:53 on the 13th of may in 1909. In this first edition the riders are confronted with 2448 kilometres, divided into eight stages. Italian Luigi Ganna is the big winner of that first event. He wins three stages and, more importantly, the overall classification. Just like its French counterpart, the Giro d’Italia has had its share of striking racedirectors. Armando Cougnet leads the race through Italy until 1948. Then the influencial Vicenzo Torriani takes over. Up to 1989 he enforces a near dictatorial regime onto the Giro. Torriani didn’t just lead the race, he was the race! His person was known by anyone. When he spoke, people knew who had spoken. He even liked to see himself glorified as a Roman Emperor. As he got older, his ‘Empire’ crumbled in the late eighties. He found it harder to keep control of the race and didn’t seem to have the same firm grasp anymore. So finally in 1989, after 41 years, a new governing body took over. These same people now organise the Giro and many other Italian cycling events. Carmine Castellano is Torriani’s official successor and still leads the race today. Naturally the racedirectors aren’t the first ones that spring to mind when discussing the Giro d’Italia. The cyclists are admired every year by millions of spectators along the route and remain the ‘actors’ of their cycling reality and imagination. They will all cheer on the “pink jersey”, no matter who’s in it, but preferably an Italian. Then the crowds really go mad! The race’s palmares is dominated by Italians. Until 1950 no non-Italian rider manages to take the ultimate prize here. The first one to do so is Switzerland’s Hugo Koblet. He is the first foreign winner in 1950 to break the hegemony of Coppi, Magni and Bartali. Still, the following years are still dominated by those first two great Italian champions. In total, both Magni and Bartali win the race three times. Fausto Coppi actually manages to get his name on the leaderboard five times! That record still stands today and was only equalled by Alfredo Binda (late 20’s and early 30’s) and Eddy Merckx (late 60’s and early 70’s). The Giro still guarantees lots of spectacle these days. The modern day victors might not have the stature of a Binda or Coppi (yet), but all winners here can be very proud of their achievements. Every year the ‘fight’ continues until the last mountainstage is ridden and remains very interesting to say the least. But all can still be won or lost. Usually an individual time trial in one of the last stages is the final decider and the gateway to the podium.